Are you ready for the program that will melt off the fat and get you rock hard abs in 90 days? If so, then you’re ready for the brand new program released by Beachbody called RevAbs, brought to you by one of New York’s finest fitness trainers, Brett Hoebel. 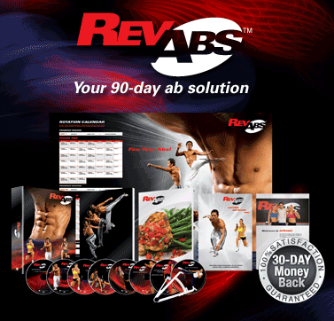 RevGuide– Easy to read, this tight little guide spells out the whole program, so you can get the most out of your 90-day ab transformation. Plus, you get Brett’s tips to win the battle of the bulge. Nutrition Guide– Get the fuel you need to Fire Your Abs. This 65-page nutrition guide comes with customizable, delicious, and easy-to-prepare meal plans for men and women. It also includes Brett’s 14-day Jump-Start Plan. It’s so effective, you’re guaranteed to lose 10 pounds and a whole size in the first 2 weeks or your money back. Anytime, Anywhere Abs– On the road or can’t get to your TV? Take this workout anywhere and do it anytime. It only takes 5 minutes. RevAbs Wall Calendar– More than inspiration, it tells you which workout to do each day for maximum results and makes it easy to keep track of your progress. Professional Fat Caliper– The perfect tool to measure your body fat before and after your transformation. See if you can pinch an inch after 90 days!